We finally have another house update for you. Sorry it has taken us so long, but the holidays happened and we got a little behind. 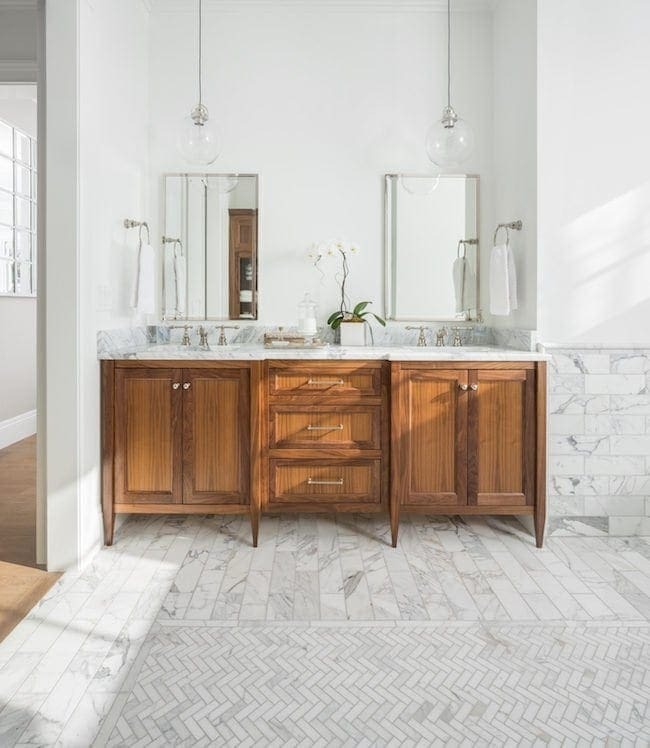 Today, we are going to take you on a little tour of the master bedroom and bathroom. This is our private space, no kids allowed. Ha! Yeah right, the boys love climbing in our big bed every morning to snuggle and watch shows with us. That is fine by us because we will take all of the snuggles we can get! The walls are Repose Gray at 75% by Sherwin-Williams. We tested A LOT of paint and this gray was our favorite. It is neutral and goes well with all of the white. 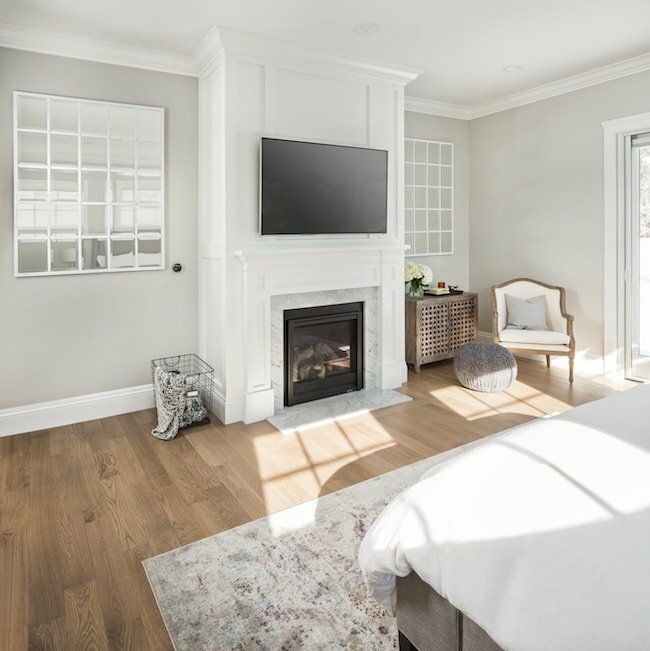 The gas fireplace makes the room extra cozy. I love turning it on in the morning and before bed. We can see the Wasatch mountains from our bedroom and the view is incredible! I love this little sitting area for reading. It is extra nice when the fireplace is turned on! The floors are white oak stained in weathered oak. Our master bathroom is connected to the bedroom. We have barn doors in the entrance. 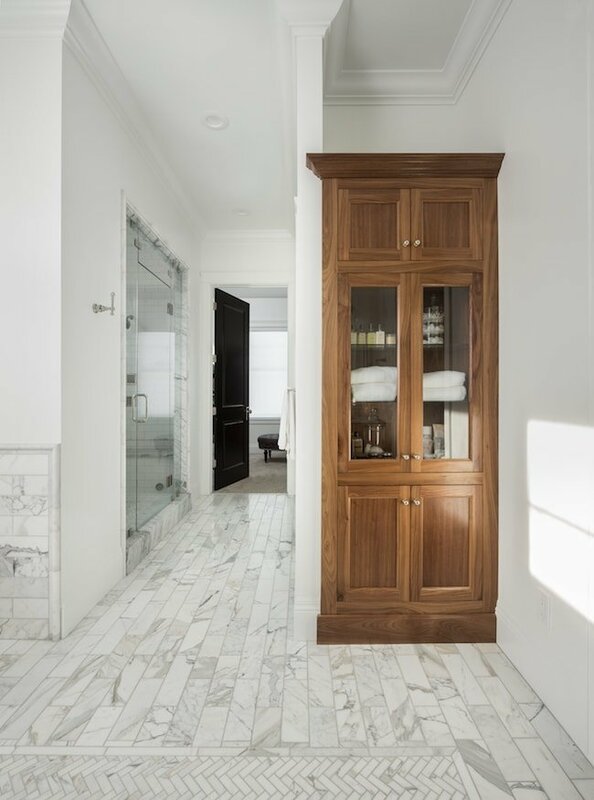 We wanted to break up the white with light walnut cabinetry and polished nickel finishes. 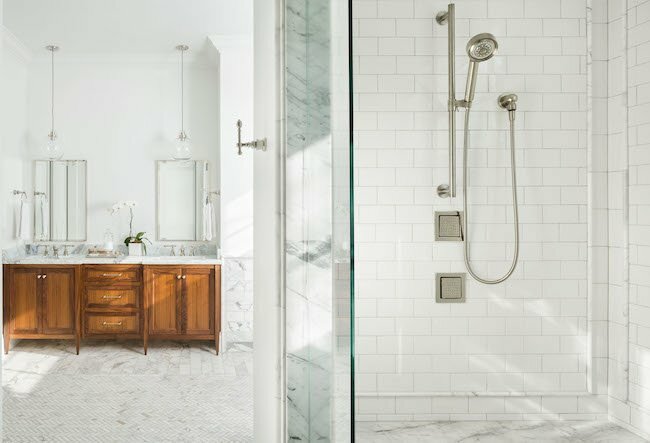 Our shower is a steam shower made with marble and white subway tile. We have a small toilet room next to the shower and our master closet is located at the end of the bathroom. 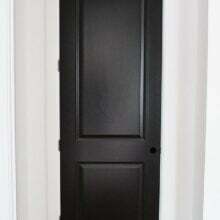 The black door is Tricorn Black by Sherwin-Williams. Thanks for going on our tour! You can view more of our home posts here. Have a great weekend! We will be back with more recipes on Monday! Thank you to the brands that partnered with us on our home: Sherwin-Williams, Wayfair, Denton Home, Joss & Main, World Market, and Kohler. Some links are affiliate links. That bathroom is like my dream master bath. Maria…your house is stunning. Wow, there is not a detail spared and you did SUCH an amazing job. I just redid my master bath over the summer and put in carerra marble but I didn’t get it heated and it is SO cold. So cold. I never knew a floor could be that cold…in SoCal! So you made the absolute right decision to get yours heated! Thanks Averie! Josh talked me into doing heated floors throughout our house and we are loving them! That is the dreamiest bath and bed. Don’t think I would ever want to leave that space. It is hard to get up in the morning..ha! Wow! Just WOW! So classic and beautiful. 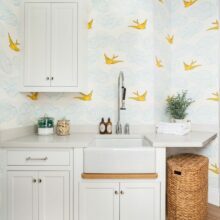 I love the vanities and the decor you use. Your master bedroom bed looks stunning. Simple but very elegant! 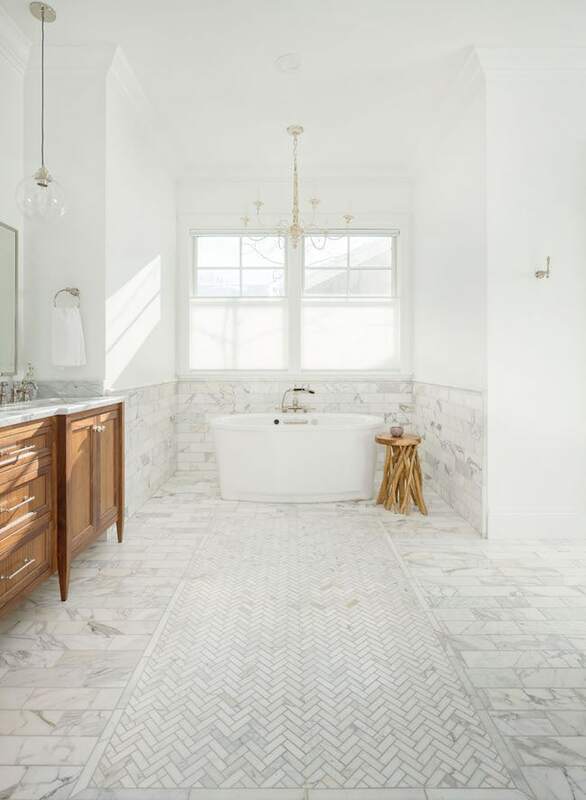 Those old fashion tubs are beautiful! How do you like using that versus a closed in tub? Thanks so much! I love my freestanding tub. It is heated and bubbles…it is so relaxing! This is an amazing bedroom and bath! I can tell you that there isn’t much room in my bedroom for anything (like in your previous bedroom) because of my queen sized bed. We are enjoying it. Thanks Maria! Very nice. Would love to have something like this. I don’t see any bureau! Where do you hide your undies/folded clothes? Your home is so lovely…designed with elegance. May I ask about your wood floors? They are the perfect foundation for your palette. The floors are white oak stained in weathered oak. Thanks! I just adore everything about your beautiful home…..love your lighting choices especially!!! Thanks! It is hard…until the boys come running in..ha! Hey girl- love the master bedroom and bath! So cool! Building a home is a wonderful experience which I’ve gone through, however a number of years back. It’s so nice to be comfy and at home especially when we need to relax, unwind and spend time with growing children. Very nice. I can see how the minimalist feeling would actually in turn shut off the mind and therefore give more room in the brain for the creative process. Otherwise we are so cluttered in life aren’t we! We have so much going on, that we don’t have time to color our lives instead. I haven’t gone to your palette but I have definitely removed and cleaned up out of date furniture with a more modern feel, and a lighter paint in all rooms, except for the one wall, which is a high ceiling wall, and I gave it a soft soft blue beach color to co with a lot of my ocean theme, since I live a flock from the beach. Bed looks so comfy that i wont wake up on time. What an absolutely gorgeous room. It must be wonderful to fall asleep each night in this room. And your bathroom I don’t think I would ever get out of the tub, sooo pretty. Loving you on Facebook and daily emails. Bedroom loks great. I really like the gray. I would add a little mroe color for me, but it is perfect for you. Just gorgeous! I would stay in that bathroom all day! You house is just as inspiring as your cooking!!! 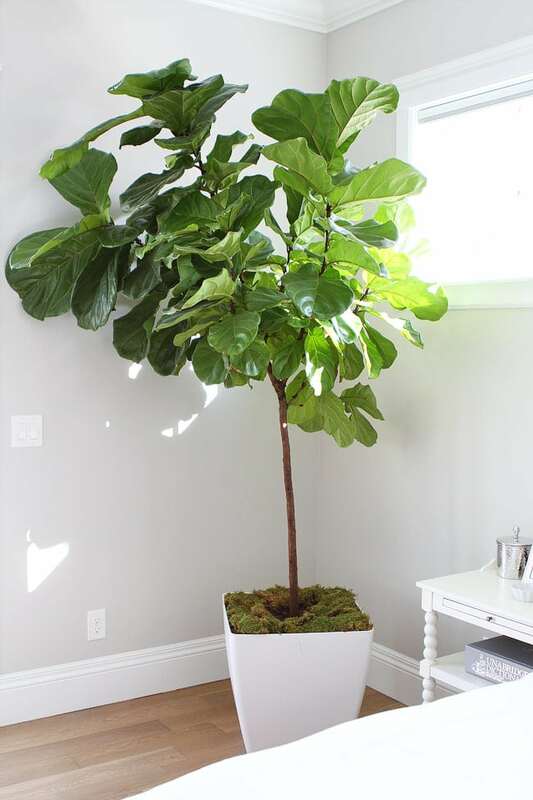 I tried looking up the Fiddle Leaf Fig Tree because I want that for my house, but I couldn’t find it on their website. Where do I need to go to. Do you live in Utah? It is a local store. You can go in and look at all of their trees and plants. No, the duvet insert is from Hayneedle. Love the colors! What white did you use for the trim? beautiful! What color did you chose for ceiling and trim? Beautiful! What color did you use for the ceiling and trim? 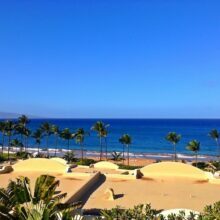 Flawless and tasteful with room to breathe and seek serenity. I am a follower… you are my oasis in the media circus. Love this bedroom! Can you tell me more about the bed? I clicked on the link but I don’t see where I can buy. The bed is from Denton Home and is a custom bed. If you call the store they can help you. You can tell them you want the bed we have:) You can pick the color, size, etc. The Repose Gray at 75% looks beautiful! Did you find that it changed the undertones slightly from Repose at full strength? Love it! This bedroom is really nice! just wondering if your bed is light grey or a beige? It is kind of hard to tell. 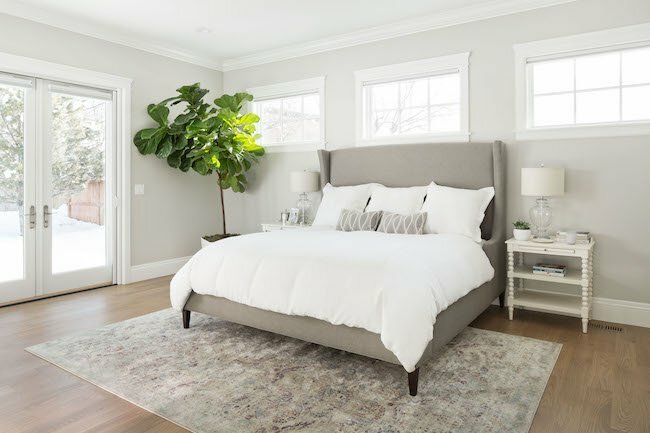 I have the same paint color in my bedroom and would love to get a bed like this one. thanks! Thanks! It is light grey. What trim color did you use in your bedroom/bathroom? Thanks! Hi Maria, what size is your rug? Are the floors laminate or wood?